foppe's acre originals: Army of love, ready for Christmas! Army of love, ready for Christmas! These sweet Matryoshkas always sell fast in the last two months of the year so I made some in advance, don't want to dissapoint anyone! I've also made a new version, which I will reveal and list in my shop soon. Stay put! A colorful end to 2017! Happy Holidays from all of us at Foppe's Acre! My messy art table this morning! 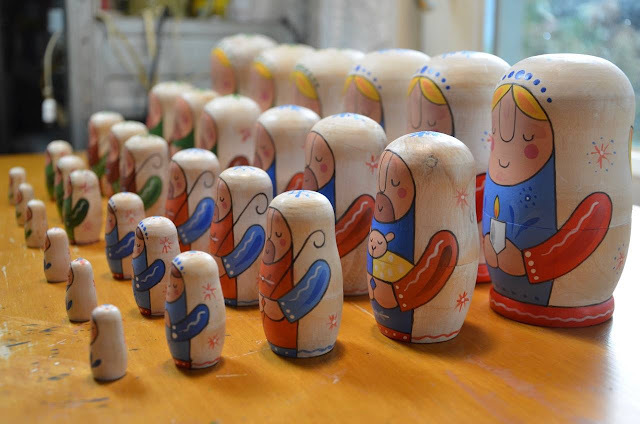 New edition to Foppe's Matryoshka collection!